We’re proud to offer the Svantek line of high-precision sound, noise, and vibration measuring devices. We provide nationwide calibration and repair services as well as regional sales of Svantek. We’re a factory-supported testing, repair and calibration lab with quick turnaround and unsurpassed customer service. 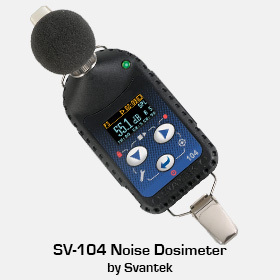 We’re particularly excited to offer the SV-104 noise dosimeter, which received the North American New Product of the Year award from OH&S. It’s extremely compact and loaded with features including a revolutionary and virtually indestructible MEMS microphone and a built-in tri-axial accelerometer for vibration shock detection. To learn more about the Svantek line or our support services, please call us at 1-800-634-4327, or click here to contact us via our online form.